With the failure of the Susan B. Anthony Dollar, congress produced legislation to change the coin to have a golden color and a smooth edge. After several suggestions, Sacagawea, the Shoshone guide of the Lewis and Clark expedition, was eventually chosen. When the deisgns were reviewed, Treasury picked Glenna Goodacre’s design with the profile of Sacagawea in three-quarter view and her infant son, Jean Baptiste Charbonneau, carried on her back. 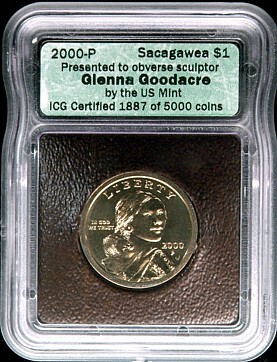 Since there are no known images of Sacagawea, Goodacre searched for someone she could model her design on. Goodacre found Randy’L He-Dow Teton is a member of the Shoshone-Cree tribe to be the model. Teton was a student at the University of New Mexico majoring in art history and was working for the Institute of American Indian Arts Museum in Santa Fe when Goodacre visited looking for Shoshone woman to be her model. 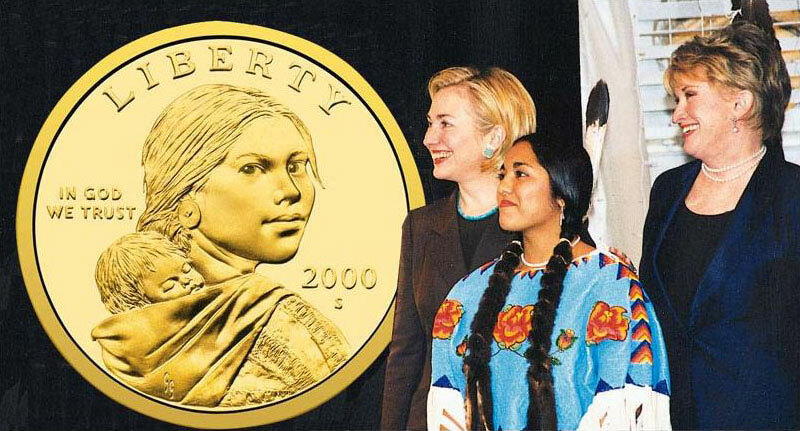 The unveiling of the Sacagawea Dollar design at the White House with (L-R) First Lady Hillary Clinton, Sacagawea Model Randy’L He-dow Teton, and Designer Glenna Goodacre. The reverse was a beautiful flying eagle designed by Thomas D. Rogers. The original Sacagawea dollar was produced from 2000-2008 with the only changes in the treatment of the coin to prevent toning. There are two significant varieties of Sacagawea dollars from the 2000 first year of issue. 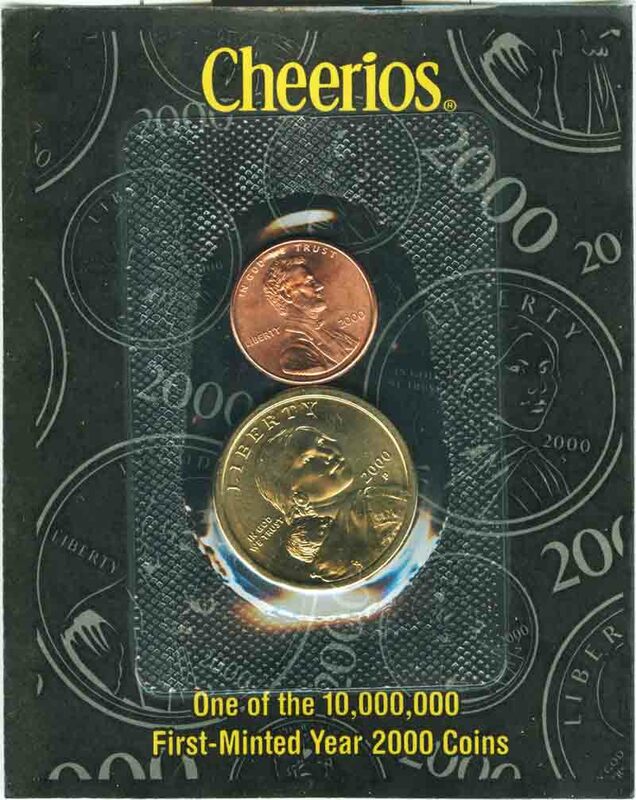 As part of a promotion, the U.S. Mint partnered with General Mills to include a 2000-P Sacagawea dollar with a special card in boxes of Cheerios cereal. Others would contain a certificate for a coin or a similarly packaged uncirculated 2000 Lincoln cent. It wasn’t until many years later that it was discovered that the coin from the Cheerios box was different from the circulation strikes. The difference between the Cheerios dollar and the circulation strikes is the Cheerios dollar has an additional tail feather and has a different, bolder shape. Of the 5,500 reported Cheerios dollars struck, only a few hundred have been found. There have been stories of estate finds where the coin was selling for under $100. Most of the time the coin has been encased in a third-party grading service holder and selling in excess of $4,500. Finding them in the original package as they were part of the Cheerios box would be a great find. When Glenna Goodacre was to be paid $5,000 for her artwork, she asked to be paid with 5,000 Sacagawea dollars. Goodacre had the coins encapsulated by third-party grading services. These dollars were specially burnished and presented to Goodacre by Mint Director Philip Diehl. Goodacre subsequently sold the coins herself and earned more money. These coins are only available encapsulated and average $500-650 per coin. A few at higher grades may cost more. A special issue was struck in 1999 in 22-karat gold in an attempt to convince congress to authorize their sale. On twelve have survived and they sent into space aboard Columbia on mission STS-93 in July 1999. The U.S. Mint reports that the coins are stored in the U.S. Bullion Depository at Fort Knox, Kentucky. Anyone selling gold Sacagawea dollars is likely selling a gold-pated coin that is not a genuine finish by the U.S. Mint. In the next installment, we look at the Native American dollar series. Sacagawea Dollar image a composit of images from the U.S. Mint. Image of unveiling courtesy of USA Coinbook. Cheerios Dollar image courtesy of user Yokozuna at the Coin Community Forum. Image of the Goodacre Dollar courtesy of ICG.